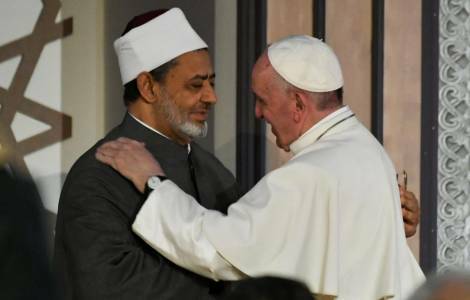 Abu Dhabi (Agenzia Fides) - The international interreligious meeting will take place in Abu Dhabi at the beginning of February, to coincide with the visit of Pope Francis in the United Arab Emirates (3-5 February). The Bishop of Rome will participate in the Conference, hosted at the Founder's Memorial, where he will hold the only official speech of his visit. The Conference, organized by the Council of Muslim Elders, will gather more than six hundred members of different religious communities, and will also see the presence of Sheikh Ahmed al Tayyib, Grand Imam of al Azhar, the most authoritative theological-academic center of Sunni Islam. On Monday 21 January - local media reported - during a press conference hosted at the Emirates Palace, the general director of the National Council of the Emirates media, Mansour Al Mansouri, wanted to underline that the Pope and the Grand Imam of Al Azhar, will launch a global humanitarian message to consolidate the values of tolerance and brotherhood, coexistence and rejection of extremism. The authorities of the Emirates are aiming at the simultaneous presence in Abu Dhabi of the Pope and of the Great Imam of al Azhar also to relaunch the image of the country as a symbolic place of human tolerance. The United Arab Emirates have proclaimed the current year as the "Year of tolerance". During the press conference also Sultan al Rumaithi, Secretary General of the Council of Muslim Elderly intervened, who in his speech also referred to the Eucharistic liturgy included in the program of the papal visit, which Pope Francis will celebrate at the Zayed Sports City of Abu Dhabi in the presence - it is estimated - of more than 130 thousand faithful. During Mass, Cardinal Parolin also recalled "the good will of past and present rulers, for their generosity in providing the land for the construction of new churches in the Country". The permission granted by local authorities for the construction of new places of worship - said the Vatican secretary of State - is "a concrete sign of hospitality that the Emirates has now shown towards Christians", and testifies their commitment in favor of "a society based on coexistence and mutual respect".